Improving on the already popular PitchHawk, the PitchHawk-G2 features a new high-brightness, high-contrast color LCD display that allows you to tune with unprecedentedly high visibility. The body has been made even slimmer, improving both design and functionality. The new PitchHawk-G2 represents the evolution of high precision clip-on tuners from Korg. The PitchHawk-G2's advanced color LCD screen provides a new dimension of visibility and much wider viewing angle. The text and meter display are also color-coded, allowing for quick and easy pitch recognition. With a slimmer and more stylish body, the PitchHawk-G2 attaches discretely and securely to the headstock of your instrument and can be stored conveniently in your gig bag or case. In addition to the conventional chromatic tuning mode, PitchHawk-G2 features dedicated guitar and bass modes, as well as the ability to make flat and capo settings, ensuring that you'll always be able to tune confidently. 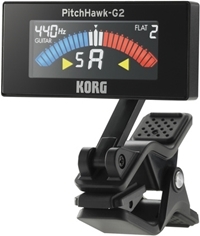 Not only has Korg improved the aesthetic of the clip-on tuner, they have improved the precision and sensitivity. PitchHawk-G2 tunes more quickly and accurately than any other clip-on tuner to date. With additional features like adjustable calibration, auto power-off, and memory back up functions, the PitchHawk-G2 is Korg's ultimate clip-on tuner.